Description: BNSF Eastbound Intermodal Train rumbles through Daggett, Ca. Description: The power for H 01-an NS C40-8W, as was common for them-mingles with the BNSF unit off H 88 and a leased ex P&W GE being used by NYSW. Quite a mix!! Description: BNSF 4476 heads an intermodel into Cicero as two trains slam the IHB. Description: The Kaiser hauler led by BNSF 4476 heads up Cajon Pass on the Palmdale cutoff past Mormon Rocks. Description: The away shot of 4476 after passing through the X-over at Lebo. He's currently meeting 6746 east, and the headlight far in the background is BNSF 5019 east, a very hot looking intermodal. Out of sight is BNSF 912 east, who's stuck behhind the 5019. 4476 is following BNSF 1058 west, who passed him here at Lebo. Description: Coming through the X-overs at Lebo from 2 to 1 after being passed. 3 trains were delayed thanks to this manuever. I hope it was worth it! Title: BNSF C44-9W #4476 leads a westbound at Jarales Rd. 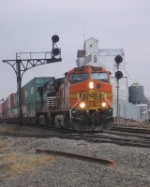 Description: BNSF Southbound grain extra on the joint line Sub. Description: At a local flea market, and heard the train. Description: Burlington Northern Santa Fé. # 4476 eastbound approacing the Chowchilla River. 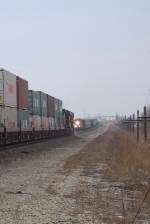 Description: A westbound vehicle train gets into the siding at Winton. Amtrak #7 has been running on their yellows all the way from Wenatchee.